18 Inches. An Elegant Looking Rack That Installs Without Hardware. Looking to solve your bathroom storage problems, but afraid of what your landlord might say, or the damage you might do to the home you own? This product is the answer you've been looking for. It's mounting brackets stick onto surfaces similar to suction cups, but they hold way better, and they can support way more weight without failing. 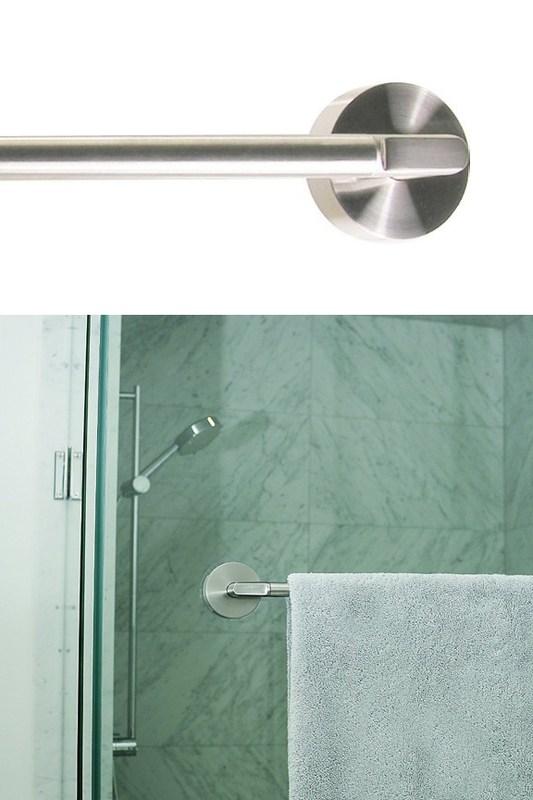 The patented system results in a towel bar that looks and functions like it is permanently installed, but it's much easier to mount in place, and you can move it or take it down without leaving any marks, holes or sticky stuff behind. You won't need any tools to hang it in place, and you'll be finished in a matter of minutes. Once it's up there, you'll have an elegant looking towel bar that feels like it is cemented in place. Unlike suction versions, you won't have to worry about it slipping down, or popping off, and because it can support up to 20 pounds, you can pile on wet towels without worry. It's perfect for apartments, dorms and rental properties where home improvement projects are against the rules, but it's also nice for anyone else that just wants a quick and simple solution to their wet towel woes. It sticks to nearly any bathroom surface, so use with confidence on tile, fiberglass, mirrors, acrylic, glass and more. Avoid shattered glass and broken tiles, but don't limit functionality or settle for an ugly looking towel rack. This stainless steel bar has a modern look, and brushed finish to match popular fixtures, but it doesn't take a drill, screwdriver or several hours of sweating to install. It hangs in a matter of seconds, and if you mess it up, or change your mind, you can easily take it down, or adjust positions. The friction mount brackets are significantly stronger than suction, they look better when on the wall, and the secure hold lasts longer too. Because the friction mount cups are made from a thinner material, they adhere to the surface completely in order to lock in place, but also to avoid unsightly flopping and sliding that's common with regular suction products. Despite the incredible hold, no sticky substance is utilized, and there is no hardware of any kind required. Install this product in difficult locations like glass doors, ceramic tiles, or inside your shower. It's not affected by steam or moisture, and you run no risk of damage to the surface you adhere it to. Strong. It's incredibly secure once in place, and it's able to hold more weight than suction products. The friction mount system provides amazing staying power so you won't have to worry about it popping off, or sliding down the wall. Simple. Solve your storage problems the easy way. This bar offers a wide range of installation possibilities, and the simple process is one that anyone can handle. Elegant. With a brushed stainless steel finish and modern design, this rack has a high end look. Fast. Up and running in a matter of minutes, anyone can mount this bar quickly and easily. Compatible. Use on doors, mirrors, walls and more. It works well on common bathroom surfaces, and allows you to install on glass or tile without any drilling, or risk of damage. Long Lasting. Suction products all fail with time. This product will remain in place like a permanent fixture until you take it down. Reusable. Easily move it to a new spot, or take it down when you move. The brackets are totally reusable, so you can change you mind any time you like. 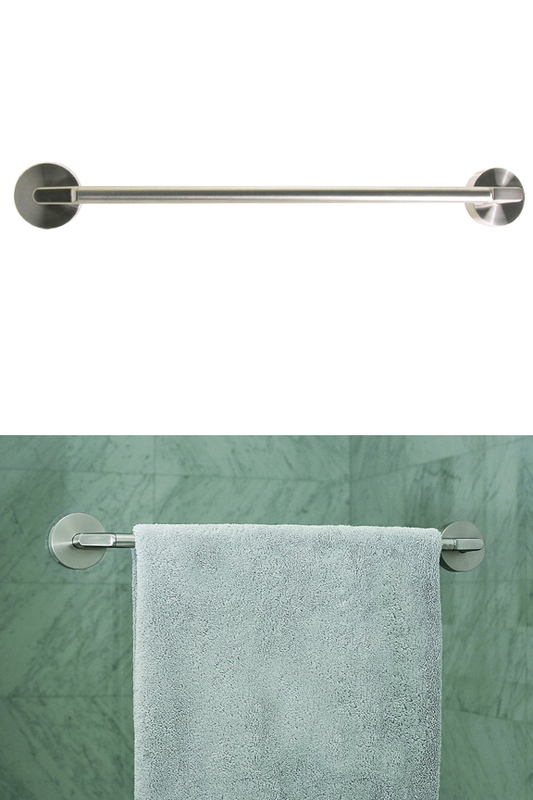 This towel bar is fully compatible with any smooth and shiny surface, and it has limited compatibility with other surfaces that have a matte finish. You'll find several places in your bathroom to use it, but it also works great in other rooms of your home where more storage would be welcomed like the kitchen or laundry room. It mounts in a matter of minutes, and installs in locations that other products would only destroy. Use it to add a washcloth rack to a glass door, or mount it on the tile right outside your shower to grab a dry towel without dripping on the floor. The brackets will hold tight to anything glossy, and the set comes with adapter sheets to allow for install on other materials. It will not work on surfaces that normally resist suction like drywall and wood. Like the concept, but looking to spend less money? We also carry a basic version in white, so if you want one that costs less, check out our White Friction Mount Towel Bar. It's basically the same size, and it can hold the same amount of weight, but because it doesn't have such a high end finish, it comes with a smaller price tag. Just as easy as suction cups, but way more permanent, installing this bar is as easy as peel, stick and hang. You won't need a drill or a screwdriver, and there is no hardware required either. It's compatible with a wide variety of bathroom surfaces, and it comes of clean, without leaving marks, residue or holes if necessary. Once in place, the bar will support up to twenty pounds, so fully saturated towels will not be a problem. Installation only takes a few minutes, but follow the steps below for best results. Prior to installation, locate the spot where you want to hang it, and make sure to clean and dry the surface thoroughly. A template is included to help with spacing the brackets. Use it to mark the location of each bracket. To ensure proper alignment, it is recommended to use a level to make sure it will be straight when you finish. In most cases, the adapter sheets will not be necessary, but for surfaces where they are, make sure to stick them in place first, then smooth out to remove any air bubbles. Sticking the brackets on the wall is easy. Just remove the backing and press in place. Place one at each of the two spots you marked off using the template. Press each friction mount circle firmly in place, then massage, from the inside out, to remove all air bubbles. Once both mounting brackets are on the wall, double check to make sure they are flush, and no air is trapped. Press at the center to reveal any hidden bubbles, then eliminate them. Pull out on the center of the bracket to test for a secure hold. To attach the towel bar, simply slide it into place. Hold the bar above the brackets, and align. Slide down to secure on the center posts. To remove or re-position, slide the bar up and off the brackets. Then peel off circles to remove them. To place in new location, repeat the steps above. Dimensions 20.5" x 2.5" x 2.5"
Uses Hang towels, washcloths, or clothes in the perfect location. Gain storage without harming the surface or drilling any holes. Perfect for the bathroom, but useful in other places too. Installation Type Friction Mount - Like a suction cup only better. Totally movable and reusable. Provides a strong hold, flush fit and does not move. Compatibility Works with most smooth bathroom surfaces as is, but also includes adapter sheets for matte tile and certain metals. Use on ceramic tile, acrylic, fiberglass, stainless steel, glass and more. Will not work on drywall or porous wood. Weight Held Up to 20 lbs. Reusable Yes. Completely reusable. 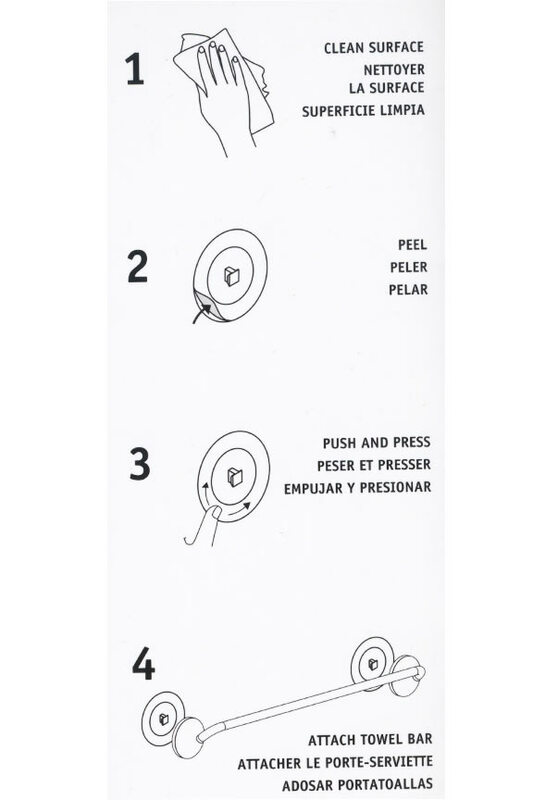 Simply peel off and re-position. Similar to suction, but way more effective. This is the perfect bathroom storage solution for rental properties and people that aren't very handy. It sticks in place in a matter of seconds, and it looks like a permanent install. There are no hardware or tools required, and there will be no sticky stuff or holes left behind if you have to move it. Order Yours Today. When I first installed the towel bar, I did not have the plastic cups installed/aligned correctly and used too much force (pounded with a rubber mallet) to push the bar down on the cups. Subsequently the plastic cups broke, but the Company was gracious enough to send me replacement cups at no cost. The towel bar is now installed and it looks and works great. Great product--installed on glass shower door for over two weeks now and used daily with large bath towels. No movement whatsoever and the installation has been solid. Best part is that there is no scarring of the glass. This was a simple and affordable solution for an extra towel rack in my bathroom. Love my towel bar, easy to install. Would recommend to anyone! 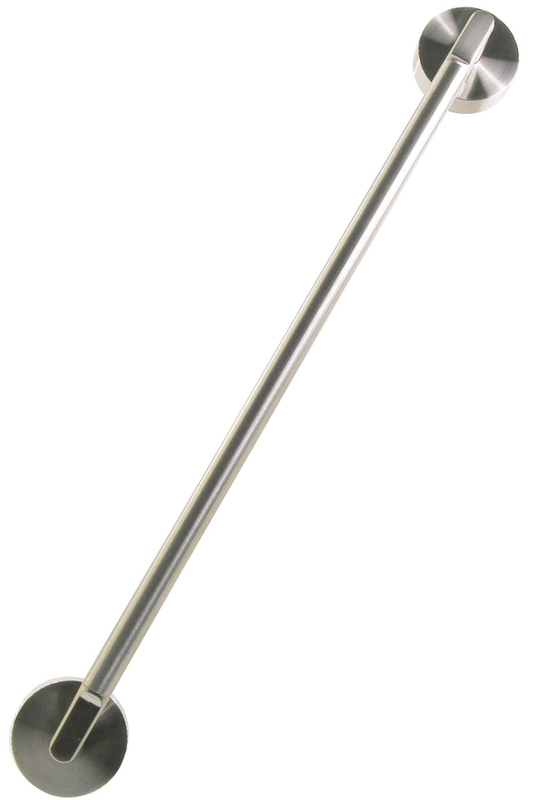 do you have any towel bars, stainless steel, in the 20" to 24" range, or is 18" the largest you have available? Currently, the 18 inch bar is the largest size available. 2 of 3 Customer(s) found this Answer helpful. Better Than Suction For A More Permanent And Professional Install. Place Almost Anywhere! Stronger Than Suction. Stick It Where You Need It. Hang Up To 10 Lbs.! 18 Inches. Reuse or Re-Position. A Stick On Towel Rack That Looks And Feels Like A Permanent Install.